We love seeing families come together for special occasions, birthdays and catch ups all year round at Fishers – but we’re especially excited to celebrate Mothering Sunday as a time to show our appreciation and thanks for everything that our Mums do for us. Let’s treat our Mothers to a relaxing, stress-free Sunday filled with beautiful, fresh food. As our own little special thank you to Mothers everywhere, we’re delighted to offer a free glass of prosecco to every Mum, for bookings made between 5pm and 7pm! Our delicious Mothering Sunday Menu features the finest South Coast fish and shellfish, where you can enjoy two courses for £22.50 or three courses for £27.95. We also have the best value Children’s menu in town (main course, dessert and a drink only £5.95!) available all day (suitable for under 7’s), so the entire family can come together to celebrate Mothering Sunday. 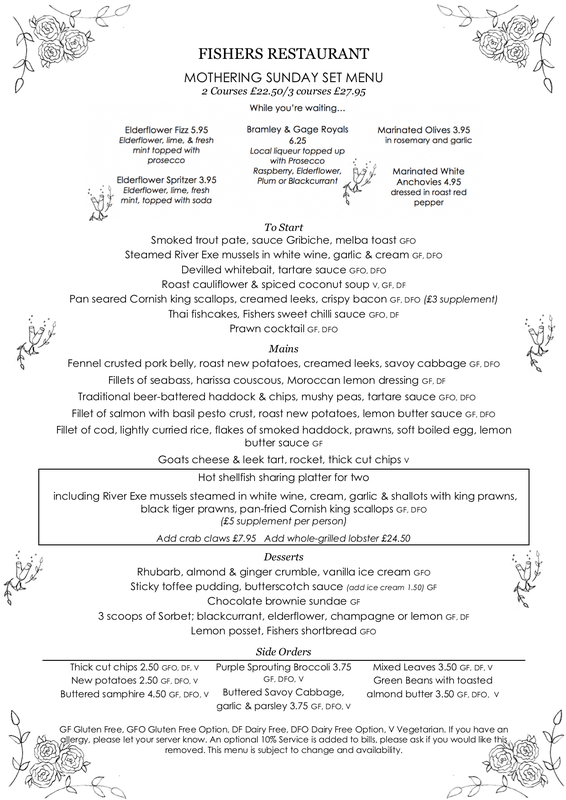 Give us a call to book a table on 0117 974 7044 or book a table online.